I purchased both of these Monthblanc 149’s with a nib that didn’t suit, so sent them both off to Hamburg as part of the free nib exchange service. The service is very straightforward but I would recommend going to an actual Montblanc boutique to do this, or sending it straight to hamburg. I would not recommend using any third- party jewellery shops which may offer the service but I found, couldn’t even manage to write down the correct information, so the pen came back with the exactly same nib (after a dramatic 3 week wait!). 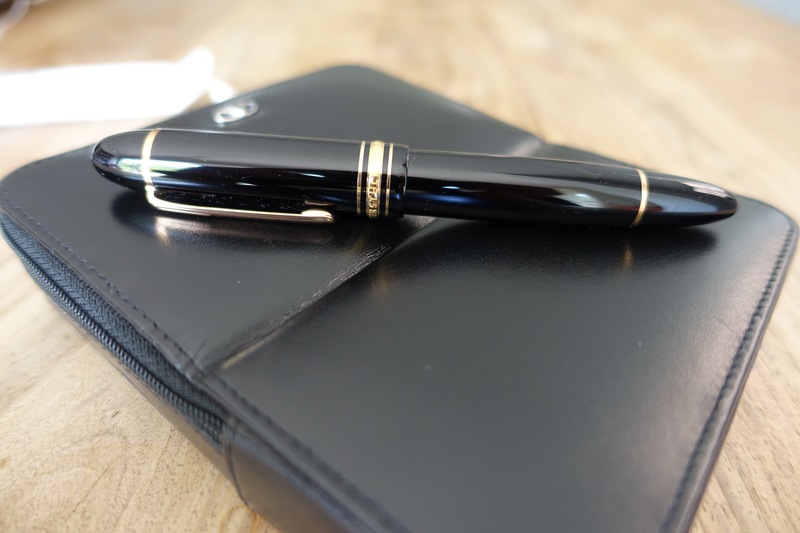 The Montblanc boutiques however are very good and you can take your pen and collect it from the boutiques yourself and they will send it off to Hamburg for you. Or you can post it to them in your home country and they will send it back for free. When I collected mine they threw in this free Montblanc pouch. To Montblanc’s credit they manufacture they’re own nibs in- house and have a very distinctive character to them. You will notice a small amount of feedback when writing which sounds like your actually writing with a pencil. A completely different writing experience to Omas, for example. The 18t Gold nib is also very distinctive. The only other nib of a similar size I believe can be found on the Sailor Kong of Pen. I got this exchanged for a medium oblique nib which gives a nice character to the writing. This is the 90th Anniversary edition Montblanc 149 from 2014. It features the same size nib as the regular two- tone Montblanc 149, but this time in single-tone “red-gold”…Montblanc’s version of rose- gold, perhaps. It also has the number “90” inscribed on the nib in large print. I had the standard medium nib exchanged for a Broad Oblique nib. This is a very unusual nib but suits this distinctive fountain pen well. …my Lamy 2000 came with a somewhat dull medium nib which I sent off to have customised into a crispy cursive italic. It also now has excellent ink flow, even with drier inks like the Sailor Mushroom series Amanita Muscaria I still have in there despite selling it months ago. No doubt it will clean right out without any bother. Very few fountain pens are as forgiving. Pelikan; another iconic fountain pen brand for Germany. 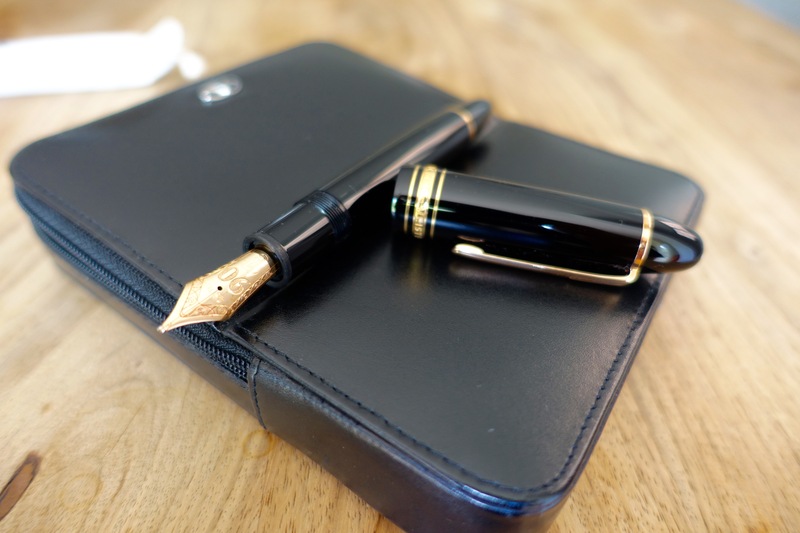 Although Montblanc is a brand everyone recognises (I had heard of Montblanc even as a child), largely due to its connotations to business, industry and wealth generally, Pelikan is much less well known. 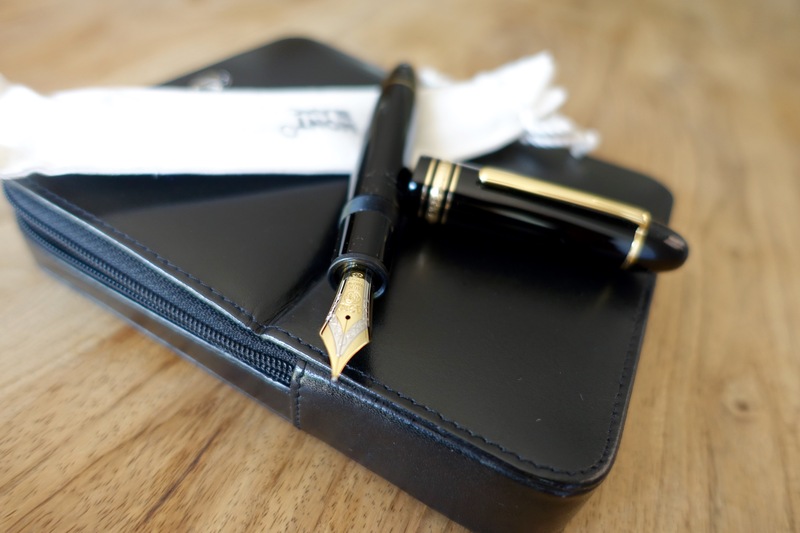 However, people who collect fountain pens routinely sight the Pelican Sovereign M1000 and the M800 as the two best fountain pens for overall design, writing experience, nibs etc. I used to have a M1000, pictured below with my M800 and Montblanc 149, but found it far too large and the “fine” nib far to broad. But not in a good way like an Omas broad. The M800 however is (now, after some amateur tuning of the EF nib myself), is perfect. It has no starting issues, lays down a good amount of ink, can be used with any ink and cleaned easily. It feels generally very reliable. However, the green/ blue/red striations they come in aren’t for everyone and if I could buy it again, I would allow the green stripe that I have in favour of the new clear demonstrator version.